Pet lovers often take overweight or obese dogs casually. Yet these dogs are at a greater risk for a number of serious consequences. Here are 7 examples of such consequences. Extra weight puts extra pressure on a dog’s joints. The cartilage in the joint deteriorates, which leads to arthritis. Sure, we can give pain medications, but weight loss helps significantly. Too much weight is a well-known risk factor for tearing the ACL (anterior cruciate ligament), an important ligament in the knee. A torn ACL must be repaired with surgery. Weight gain can cause heart disease and high blood pressure. It’s also linked to breathing problems. Overweight dogs are more prone to a collapsing trachea and laryngeal paralysis. Untreated, these airway conditions could lead to a respiratory crisis which could be fatal if not treated. The heart and lungs of overweight and obese dogs have to work harder during anesthesia. The dog struggles to breathe because he has difficulty expanding his chest. Dogs often sleep too deeply or not deeply enough. In addition, overweight dogs may take a long time to wake up after anesthesia. Obesity may increase the risk of certain tumors such as benign fatty tumors (lipomas), as well as breast and bladder cancer (transitional cell carcinoma). Overweight dogs have extra skin folds, which can cause irritation and infection by bacteria. This can lead to scratching, body odor and skin redness. Overweight dogs often have an unhealthy looking coat because it’s harder, if not impossible, for them to groom effectively. Obesity can take up to 2 years off the life of your dog! Quality of life is also lower. Carrying extra pounds around takes a toll; overweight dogs are slow to get down and up, they get winded or tired quickly and are less likely to play. How can I keep my dog trim and healthy? Schedule an appointment with your family vet so you can tailor a weight-loss program to your dog’s needs. There are no miracles to losing weight: eat less and exercise more. Eating less will involve sticking to a balanced weight-loss food. It’s also reasonable to cut down on treats and “people food.” However, it’s not considered ideal to cut down on the amount of food unless your veterinarian suggests it. Starving a pet is just as bad as overfeeding. The other requirement for losing weight is more exercise. Fortunately, this is the good part! It involves more time having fun with your dog. Overweight or obese dogs aren’t beyond saving. The situation can be corrected. 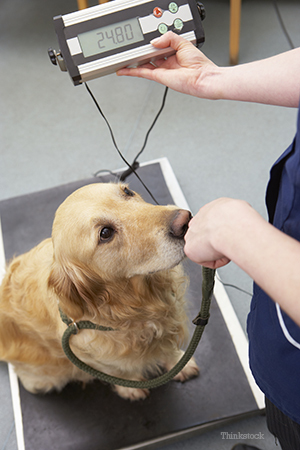 Your family vet can provide you with the tools and the knowledge to help your dog live a long and happy life. You simply need to have the awareness and the motivation to act. Hopefully, having a happy and healthy dog is enough motivation.